The DRONEXT project addresses the design of a multi-service communication framework for the protection, safety and defense applications of the secure societies of the future. Our solution uses an infrastructure of Micro Air Vehicles (MAV) to provide communications and service coverage in delimited geographical areas, in which there is no appropriate communications for the applications to be deployed (non-existent or unavailable due to a natural disaster for instance). 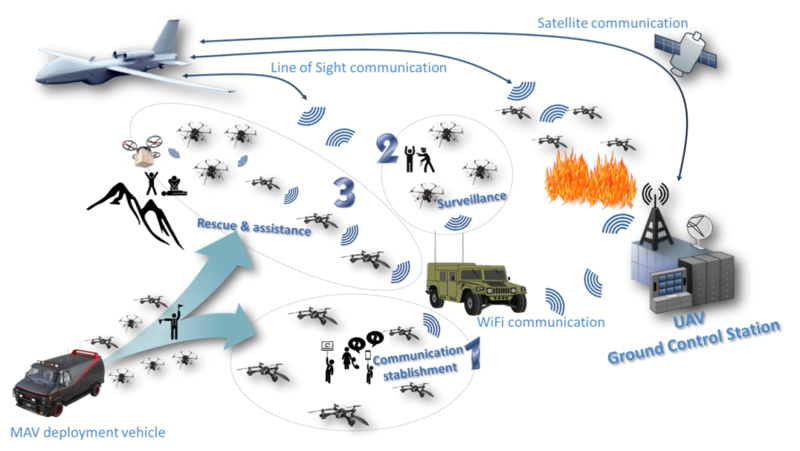 Additionally, the framework under development uses larger tactical Remotely Piloted Aircraft Systems (RPAS) to communicate distant geographical areas, where MAVs coverage is supported, with a Ground Control Station (GCS), which provides connectivity towards control centers responsible for coordinating the execution of the operations that required the network deployment. Our framework makes use of virtualization techniques, to support the fast and adaptable deployment and upgrade of any functions and services over the MAV infrastructure (e.g. VoIP services, routing, positioning algorithms, video recording and transmission, etc.). The use of virtualization, and the coordination of MAVs and larger tactical RPAS, provides the flexibility to address a wide variety of use cases related to protection, security and defense. An overview of the framework design, along with a subset of its use cases, is presented in Figure 1.